We've had so many storm warnings here in the south the last few days that I've taken to reading stories about the blitz in England during WWII so I can use the constant sirens as sound effects. It really does add something. Social networking sites have just turned into weather update centers to tell me what I'm already hearing the local weather man tell me non-stop for hours on end. My favorite part is when they tell me to turn the TV up plenty loud so I can hear it from the closet and not to come out until they tell me to. In the next breath they let me know that they would love it if I could send photographs of the horrid weather...but only if I can remain safe while doing it. My future-son-in-law was here last night and thought he was going to get to see Glee at its regular time. I explained that the weather frenzy would be taking up every channel. He doubted me. I changed the channel to humor him. Okay, I really did it to prove my point. No Glee. Literally or figuratively. The weather man instructs us to put on our shoes and have an ID on us. I'm thinking about writing my SS# on my arm in sharpie so if they find my body in a tree whoever gets me down can steal my identity. Oh blast! Lights are flickering so I'm rushing to post this. Get the coffee ready just in case I blow into your town. Kansas & the Razor's Edge: Eating, Praying, Loving. "There's no place like home." the wizard had Dorothy say while clicking her heels. I'd agree with that in a lot of ways, but can't help wonder if the gingham clad heroine of that tale would have traded all she learned on her adventure to stay at home and help on the farm. I think not. The story of home is safety, comfort, predictability. While all those things are nice, a constant dose of them can be stifling which is what made Dorothy long for adventure over the rainbow. She's only able to come to the conclusion that home is the best place in the world after leaving it and learning something about herself apart from it. Had she stayed safely in the confines of Auntie Em's care she would likely spent a life filled with a certain restlessness, wondering what it was she'd missed. We, knowing all she would have lost out on, shudder at the thought. At the library used book sale over the weekend I picked up a lovely and worn vintage copy of The Razor's Edge, a story of travel combined with searching for meaning in life, a recurring theme in literature which has more recently given us Eat, Pray, Love. So what is the connection between all this wandering and wondering? 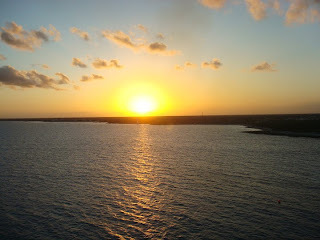 Mark Twain said " Travel is fatal to prejudice, bigotry, and narrow-mindedness." That is certainly true on a larger social scale but I suspect it may also be true on a very personal level. We are likely to catch a new glimpse and expand our view of, not only the world around us, but of the one within us. We are more willing to let go of our narrow-mindedness about who we are as we embrace new experiences in strange places. We are going, whether we want to or not, to learn something about ourselves. Finding ourselves outside of our normal roles of employee, spouse, parent--being recast as merely a person in the larger world, is freeing while also being uncomfortable, challenging, and exciting. If "all the world's a stage" some of us desperately need new lines and a scene change from time to time. Our own selves, cast in a different light, may surprise us. My dream trip to Italy, taken a couple of years ago with a friend, was life altering. Something new was woven into the edges of life's fabric and added an inexplicable layer of richness. Questions were answered; others beckoned. We just recently discussed over a long lunch how much fear that we'd harbored for years dropped by the wayside on that journey, a magical turn in a twenty year friendship. So when I read Somerset Maugham's story of Larry's search for answers I feel for him and the fact that few understand it. Least of all his fiance, Isabel who I dislike and not just because she says "I'm twenty, in ten years I shall be old." I can't help comparing her to Elizabeth Gilbert who enticed us with her journeys through Italy, India, Bali. Ms. Gilbert would have been an apt companion for Larry's spiritual journey. Quests call for loyal companions of like mind as all good storytellers know. A fellowship, a band of brothers, at the very least an honest friend, sometimes taken along, other times met along the way. In these three stories the friends are picked up as the roads and the stories unwind. Unusual bonds are forged between travel companions, no one else will quite understand your experiences like those who have shared them. You cannot travel and remain the same, as Twain knew. You will, as Gilbert knows do some eating, and if you are a conscious traveler you will also pray and love. You'll try new things and expand your culinary horizons. You will pray prayers of gratitude and wonder, prayers of thanks for the kindness of strangers. You will fall in love with art, and sweeping vistas. You will love cities and the people in them, you will love fellow sojourners you meet on the way, as well as love and appreciate friends left behind and relish afresh the comforts of home. Mr. Snarky and I were talking the other night about college and art and the news when out of left field he says " It's too bad society frowns on adults playing with Legos." We both really miss Legos. 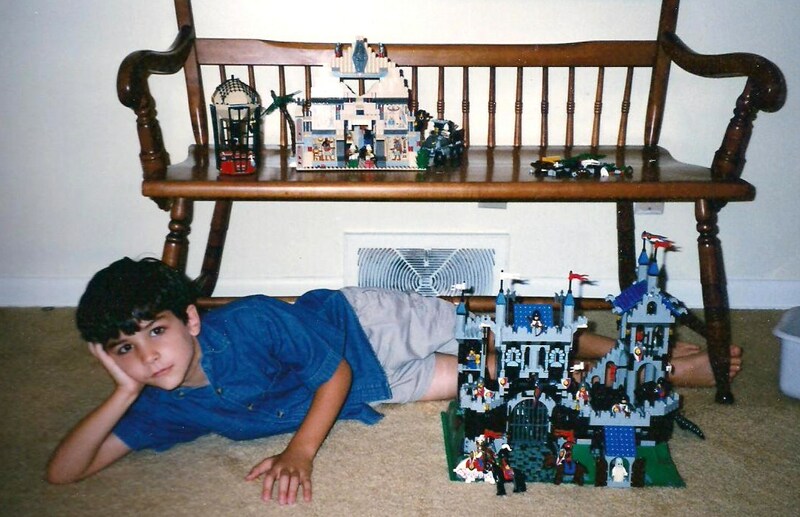 I once sold a bedroom suit that was in our then guestroom (now office) so that it could be completely empty except for thousands of Legos; we spent hours and hours there. My son and I both drool over the new sets that come out. We are especially fond of the Star Wars and Indiana Jones ones. For some reason my daughter thinks this makes us extremely nerdy (I don't think a woman who keeps 4 color-coded calendars should be judging anyone). Sometimes in Target we wander over to the toy aisle. We both pretend we are lost and then say something clever to hide our true intention like "How did we end up here? Oh look at that one. I wish they'd had that when...."
At that point our sadness overwhelms us and we go to electronics. Electronics is the socially acceptable department for a mother and grown son to be in. I think they are, quite simply, the best toy ever made. Once when my son was young I heard a mother say "I don't let them have Legos. I don't want to have to pick up all those tiny pieces." I'm sure this constitutes child abuse. DHS should have an entire department to deal with it. Her child has doubtless suffered irreparable spatial ability damage. I hope she's happy. So when Mr. Snarky and I were discussing the adult/Lego quandary the other evening I cheered him by reminding him that his sister is getting married soon and in the not-too-distant future he will probably be an uncle. It is perfectly acceptable for adults to play with toys if children are present. His face lit up as he pictured the enormous bin shoved in the back of an upstairs closet chocked full of thousands (possibly tens of thousands) of tiny plastic pieces of imagination. "It's the real reason people have children." I said. WHY DO I KEEP TALKING? Ooops...probably shouldn't have let that little adult secret out of the bag. I know how to make pralines. Mr. Snarky and I took a cooking class (Cooking classes taught by a former NFL football player are deemed acceptable in teen aged boy world.) in New Orleans a couple of years ago and they were one of the things we learned to make. It is like knowing how to make crack. Last year at Christmas I decided to make them to give away for gifts to my neighbors. I laid them out on the island to cool. Yes...as in 10 plus 4. The neighbors ended up with lemon pound cake. You want the recipe don't you? I struggled with the ethics of posting such a dangerous piece of information on this blog. I'm not responsible for what you may choose to do with this information--making and eating a grotesque number of them, for instance. 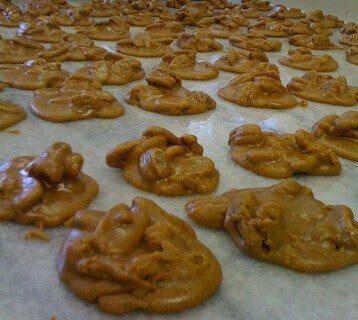 The New Orleans School of Cooking makes, hands down, the BEST pralines in the Quarter. Combine all ingredients and bring to a "softball stage" (238-240*), stirring constantly. Remove from heat. Stir until mixture thickens, becomes creamy and cloudy, and pecans stay suspended in mixture. Spoon out on buttered waxed paper, aluminum foil, or parchment paper. Note: To roast pecans bake them on a sheet pan at 275* for 20-25 minutes. "Softball Stage" is reached when you place a spoonful into a glass of water and it sticks to the side. While I was spending 10 days 24/7 with my daughter recently I knew it was only a matter of time until she brought up her tragic childhood to our travel companions. 1.My mother locked me out of the house when I was 3. Okay, that one is true but, I mean, have you HAD a three year old? It was for 5 minutes in a fenced in backyard. It was a literal time OUT. And it was better than the alternative. 2. My mother ruined my life because I didn't get to go to kindergarten. Wow. I'm sorry I kept you home reading the classics out loud and taking you to museums and that you missed nap time on the floor and no one wiped boogers on you. How can you ever forgive me? 3. I didn't get to have a Barbie. We had our share of hormone induced, female meltdowns over the years, something that doesn't happen in a mother/son relationship. Usually, when we both calmed down and all was forgiven, we ate chocolate. Boys are easier to raise but they cannot be tamed with Godiva. Later on they may be tamed by a diva, but that's a different set of problems. Well, who cares? We aren't going to be in this room anyway! We are going to be out and about in Athens! Things don't always go according to plan...we'd been in Athens only a couple of hours when I became ill was placed in a taxi and taken back to the hotel. That taxi ride was the highlight of the city for me and I think Mr. Suitcase is going to tell you all about it in a future post. He was highly amused. That lovely little bed on the right is where I spent the next 24 hours. I should have taken a picture of the ceiling, it's what I remember most clearly. Finally just a few hours before boarding a flight to return home, my daughter begged me to at least ride the elevator up to the 12th floor to see the Parthenon in the distance. The rooftop view was lovely and the fresh air probably did some good, but frankly I hoped to see no one. I didn't want to scar anyone for life. I was frightening I tell you. At one point I looked so bad I nearly took a pic but decided I had to draw the line somewhere about what to share with you on this blog. But oh, how entertained you would have been! The Parthenon was lovely even from this distance. It could not compare at this moment however, to a little red brick house I was longing for. Oh my...there really is a first time for everything.